The graceful, historic racing yachts designed by the Logan and Bailey families in New Zealand are amongst the finest examples of early New Zealand boat building. And highly prized, they are now sought by collectors. Many are more than a century old. In New Zealand, they are protected by law and prevented from leaving the country. At 85years, Valkyrie is a valuable example of a classic New Zealand kauri schooner. Valkyrien - once Valkyrie - was built in Auckland by the Chas Bailey yard in 1928 for the Master-Owner, Captain Ernest Gilling. Her solid hull of quadruple kauri planking has helped her through an adventure packed life in the Pacific. And the tales of her past are a leaf from history. 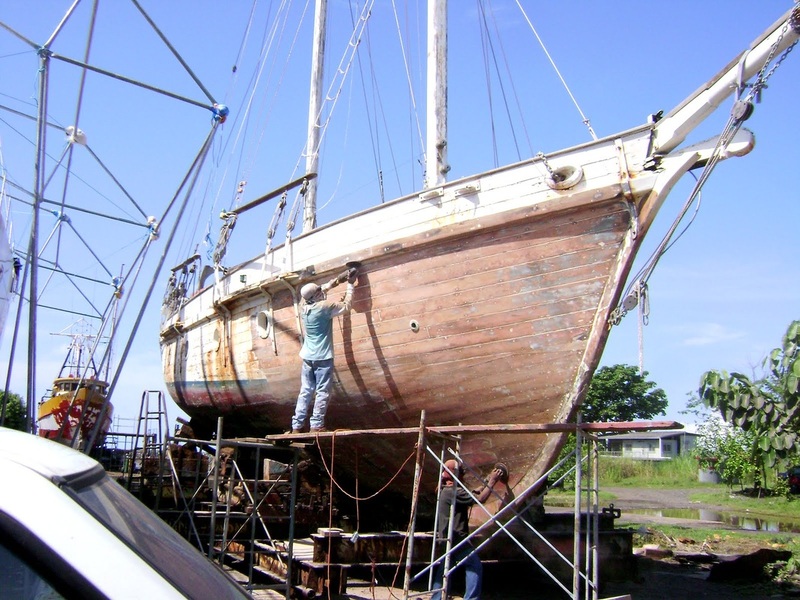 This beautiful schooner - one of the few outside New Zealand - has had restoration started in Panamá. It is hoped she will become a Sail Training schooner and bring the love of seafaring to the young people of Panama. Currently, she is need of funds. The hull is water-tight. She has a new keel and deadwood and a re-built wooden rudder, A new deck has been started. We need to complete the deck, varnish and re-install her mast and then give her a classic interior that will place her among the outstandingg classic kauri planked yachts. Valkyrien - now Valkyrie - was built in Auckland New Zealand by Chas Bailey and launched in 1928. She is a classic quadruple planked kauri schooner built for ocean voyaging - not coastal sailing. 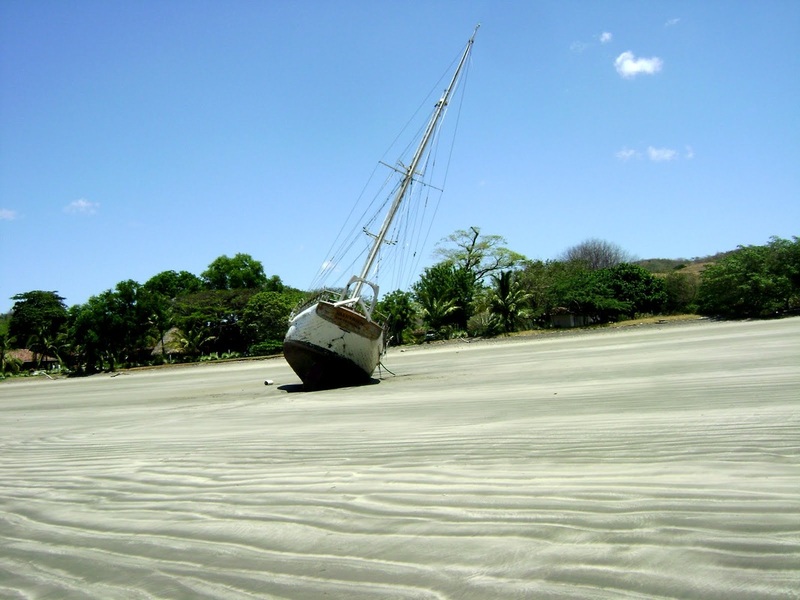 Valkyrien was abandoned at Playa Venado - also known as Playa Venao - a surfing beach. She was high up the beach and could only be floated on a very high tide. Getting her to Vacamonte and off the beach was a major challenge, that involved 16 hour work days and caulking at night when the tide was down. These photos are a record of the work and the success of the rescue. 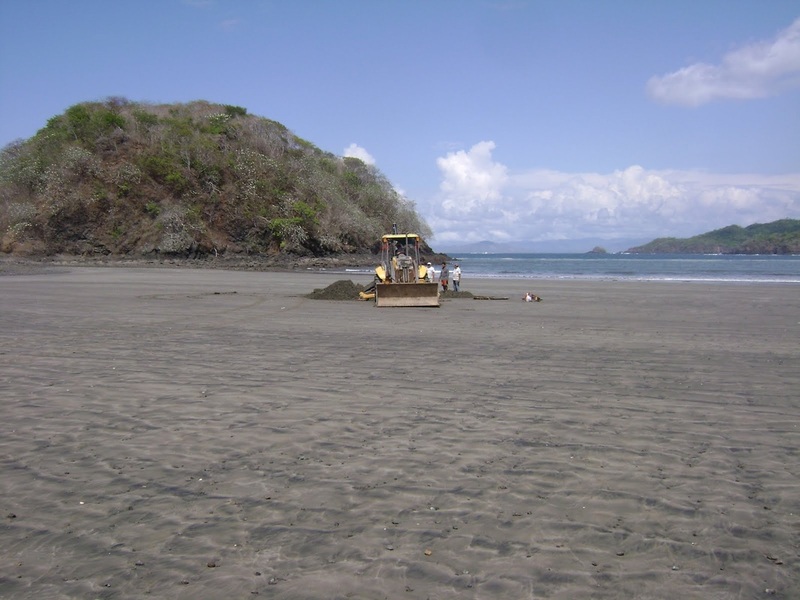 Our workers, the local surfers and the Autoridad Maritima were ecstatic with the outcome. Note for any others that plan to dump a boat on the beach and walk away. This is illegal in Panamá. The decision was made to save her, float her off and take her to the Astillero Nacional in Vacamonte. An historic boat, built in New Zealand with quadruple kauri planking, she deserved to be saved. Also, on the beach she represented a hazard to surfers and violated Panamanian law that does not permit abandoning wrecks on its beautiful beaches. So, a watchman aboard, and at the next high tide in late March we floated her and took her to Vacamonte under tow. Restoration is underway. Delivery - No! She is on the beach! Valkyrien reached Panama leaking badly - in need of repair. Storm conditions off Punta Mala forced her to Playa Venao with a broken boom, her engine overheating. Her deep keel hull with an 8.5 ft draft was anchored high up the beach on a spring tide - unable to be moved until the next high tide a month later. The schooner lost her lead keel and deadwood. Wave action on this surf beach presented a problem. She had to be patched and temporarily repaired, so she would stay afloat on her tow to Vacamonte. This meant 16 hour days and night work for our team. Work could only be done when the tide was out. Valkyrien's 'new owner' agreed to pay for the repair on the beach whilst we waited for the tide. There was a lot of work to be done to ensure she floated and would make it under tow to Vacamonte. Our shipwrights worked 16 hour days on emergency patching and repairing to make the hull sufficiently water tight for the tow. They also worked patiently todig channels around the boat so they could repair under her and turn the boat on each tide so she would float off bow first, when the moment came. 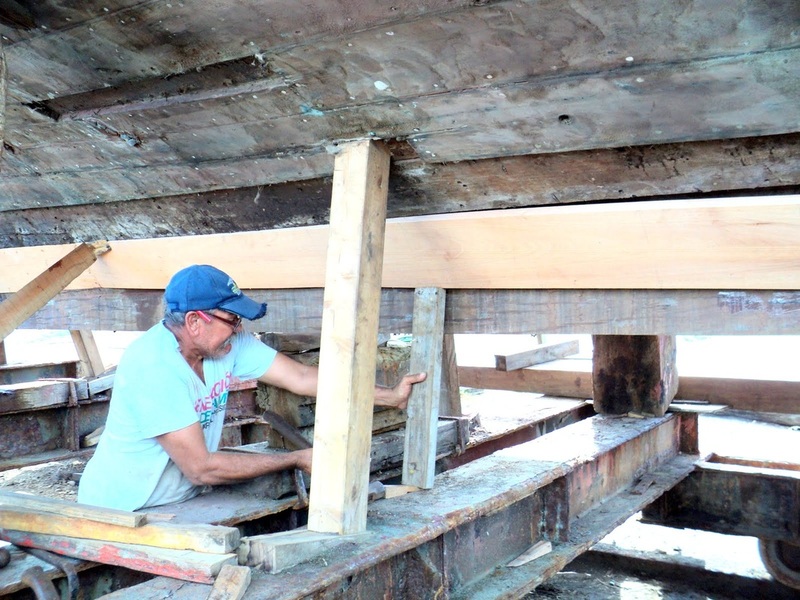 Laying the schooner on the beach caused the keel and deadwood to separate from the hull. The cost of buying more lead for the keel was daunting. So we returned to the beach and recovered the original lead. This will have to be melted and poured into a mold and attached to the new deadwood. These tanks were 1/2 full of fine sand & water - except the tank that had a hole. They will be wire brushed, corrosion treated, pressure tested for leaks, painted and reinstalled. Below the tanks and engine, we found concrete, which when a boat is leaking is used as a quick fix. Sometimes it works. This is being removed to look at the inside of Garboard planks & lay down some Epoxy resin and rebed new keel bolts. This should stop leaks. The stern deadwood around the propellor has been fitted and bolted in place. It fits well. Another major task completed. Meantime, paint was slowly removed with paint remover. It was very thick and old and hard to budge. We now seem to be down to the green of the 1960's. The quadruple planked 1928 Kauri schooner lasted a month on Playa Venao´surf beach, because of her solid construction. 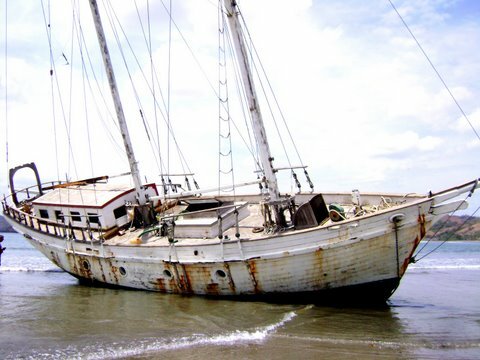 The worst damage was inflicted on her keel and garboard planks. To get her back in the water as fast as possible, new kauri planking was not an option. Cedro Amargo - a good local wood - was selected for its resistance to rot and worm. Planks have been cut, the boat is being caulked and the tanks are being treated for rust and repaired.